Diagnosis of Early Chronic Pancreatitis by Endoscopic Ultrasound. Are We There Yet? The diagnosis of chronic pancreatitis at an early stage is a clinical challenge. A major limitation is the inability of clinicians to obtain a tissue or histological sample to confirm the clinical diagnosis. Currently available imaging modalities have limited sensitivity or specificity for diagnosing early chronic pancreatitis. Endoscopic ultrasonography (EUS), introduced in the early 1980's, was first developed to image the pancreas. It overcame many of the limitations (abdominal gas and fat) of transabdominal ultrasonography when evaluating patients for possible pancreatic diseases. To date, EUS represents the most promising imaging modality for diagnosing chronic pancreatitis. Contrary to endoscopic retrograde pancreatography (ERCP), EUS has a very low risk of complications and can detect abnormalities suggestive of chronic pancreatitis in the pancreatic parenchyma and ductal system which are not visible on any other imaging modality. The minimal changes in echotexture are difficult to interpret because there is no reliable gold standard confirmatory test. There is now some evidence in the literature suggesting that these early changes detected by EUS correlate with the histological changes of chronic pancreatitis and may predict progression to more advanced disease. The EUS diagnosis of chronic pancreatitis relies on quantitative (more than qualitative) parenchymal and ductal criteria found during evaluation of the pancreas. It is generally accepted that, in the absence of any criteria, chronic pancreatitis is unlikely, whereas in the presence of 5 or more criteria (out of 9-11) chronic pancreatitis is likely although ERCP and pancreatic function tests may still be normal. The diagnostic significance of patients with fewer (1-4) criteria found on EUS is currently unclear, particularly when other diagnostic tests such as ERCP and function testing are normal. In these cases, there is a potential for "over-diagnosis" of chronic pancreatitis, since the EUS changes cannot be confirmed by other modalities. How can we better understand the implications of EUS detected changes when other tests are normal? 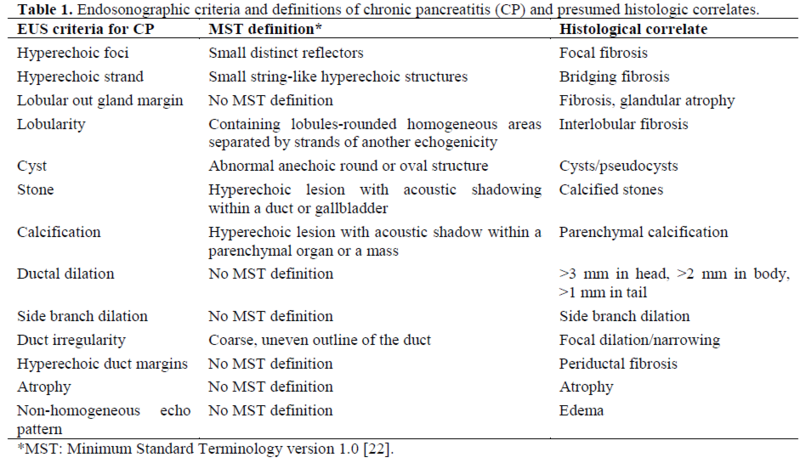 In order to address the issue of “Is EUS overdiagnosing chronic pancreatitis (CP)?” it is crucial to recognize what normal features of the pancreas look like on EUS . Wiersema et al. evaluated the endosonographic criteria of a small group of healthy volunteers with no prior history of abdominal pain or alcohol abuse. The pancreatic parenchyma was homogeneous and more echogenic than the liver. A ventral anlage was detected in 45% of the cases. No cysts were seen. The main pancreatic duct diameter was 2.4 mm (range: 0.8-3.6) in the head, 1.8 mm (range: 0.9-3.0) in the body, and 1.2 mm (range: 0.5-2.0) in the tail. Side branches were visible but narrow in normal individuals (mean diameter: 0.8 mm, head; 0.5 mm, body; 0.3 mm, tail). These data from control populations and healthy volunteers provide important standards for the normal endosonographic appearance of the pancreas but are limited by their small numbers and potential biases in control populations. Ikeda et al. reported the transabdominal ultrasound (TUS) features (using a 3.5 or 5 mHz transabdominal probe) of the pancreas in 130,951 "screening" examinations performed in Japan. Although these data have limited generalizability to EUS, several important conclusions can be made from such a large population survey. Pancreatic duct diameter, which is measured similarly by TUS and EUS, was dilated (>3 mm) in only 0.49% of individuals and was more common in males and older individuals. There was a strong trend toward increasing duct diameter with age, suggesting that age should be taken into account when defining a “normal” duct diameter. Cystic lesions were detected in 0.21% and calcifications in 0.05% of individuals although TUS may underestimate the prevalence of these abnormalities compared with EUS. Several studies have evaluated the pancreas in "control" populations, such as those undergoing EUS for non-pancreatic indications such as non-pancreatic tumor staging, submucosal tumors, or portal hypertension [3, 4, 5]. Although being important contributions, there may be important pancreatic changes in these populations due to similar risk factors (ethanol) or severe cachexia (non pancreatic malignancies). Nattermann et al. reported EUS findings in 20 patients without suspected pancreatic disease. They described the pancreatic parenchyma as a "homogeneous fine granular pancreas with smooth margins". The pancreatic duct diameter in the body was 1.9 mm on average (range: 1.5-2.4). Catalano et al. reported 25 patients without suspected pancreatic disease. They described the parenchyma as "homogeneous and finely reticulated without evidence of side-branch ectasia". A ventral anlage (echogenic difference between the ventral and dorsal pancreas) was seen in 68% of controls. No cysts or stones were described. The main pancreatic duct was uniformly tubular in shape with anechoic walls and a mean diameter (in the pancreatic body at the portal vein confluence) of 1.7 mm (range: 1-3 mm). Only 2 controls had a duct diameter of 3 mm (Catalano M, personal communication). Side branches were visible in 32% (8 of 25 patients). When assessing the accuracy of a new diagnostic test, it is critical to establish a "gold standard" to which it may be compared. Unfortunately, there is no agreement on an appropriate gold standard in CP, especially early or minimal change CP . Histology is the most obvious candidate; however, there is little agreement on the histologic features of CP, and those features that are described are often focally distributed or subtle . One measure of early CP is whether a patient responds to pancreatic specific therapy. Walsh et al. identified 43 patients who had characteristic symptoms of pancreatic disease but normal or equivocal ERCP, CT or ultrasound. Those patients (16 patients), whose symptoms failed to respond to medical therapy (enzyme replacement, low fat diet, and at least 3 trials of bowel rest with total parenteral nutrition), underwent pancreatic resection. The histologic appearance in the pancreas of these patients showed subtle but distinct evidence of minimal-change chronic pancreatitis. These changes were "focally" distributed throughout the gland and included lymphocytic cell infiltrates, intralobular and periductal fibrosis, and focal ductal dilation with inspissated protein plugs. Nine of the 16 patients had complete or significant improvement in pain after total pancreatectomy, whereas 5 did not respond and 1 died of unrelated causes. The histologic changes and response to pancreatectomy suggest that these patients had CP despite normal imaging and functional testing. However, a placebo response cannot be excluded. In the absence of a gold standard, diagnostic tests must meet other accepted criteria to be considered valuable. These include inter- and intra-observer reliability, correlation with other validated (albeit non-gold standard) tests of the disease, and prediction of response to therapy. EUS meets some, but not all of these criteria. A fundamental requirement for any test is reliability. When no gold standard is available, this is often measured as the degree to which practitioners agree on a diagnosis. Wiersema et al. compared the degree of agreement among 3 experienced endosonographers reading individual criteria of CP. The agreement was 88% for hyperechoic foci, 94% for focal reduced echogenicity, 94% for lobularity, 83% for hyperechoic duct margins and 94% for duct irregularity. To further improve the reliability, an "International Working Group" has published a set of "Minimum Standard Terminology (MST)", including definitions, for many of the EUS criteria of CP . As with many tests, the reliability of a test in practice is often lower than that in controlled trial settings. We have evaluated the interobserver reliability of EUS for the diagnosis of CP by 11 highly experienced endosonographers. Agreement was measured by the Kappa score, where a result > 0.4 is generally considered “fair to good” agreement. There was moderately good overall agreement for the final diagnosis of CP (Kappa = 0.45) and for individual criteria of duct dilation (Kappa = 0.6) and lobularity (Kappa = 0.51), but poor for the other 7 criteria (Kappa <0.4). The expert panel had consensus or near consensus agreement (>90%) on 206 of 450 (46%) individual examination criteria including 22 of 45 diagnoses of CP . Though similar data from “less” expert endosonographers or fellow in training are lacking, it seems that the agreement in the EUS diagnosis of CP is comparable to other commonly used endoscopic procedures such as bleeding ulcer stigmata (Kappa = 0.34-0.66) , and radiological procedures such as brain CT for stroke localization (Kappa = 0.56-0.62)  and better than the physical diagnosis of heart sounds (Kappa = 0.05-0.18) . Zimmerman et al. and Dr. Brenda Hoffman (personal communication) reported the EUS criteria in comparison to the histologic features of CP in 34 patients who underwent EUS followed by pancreatectomy or open surgical biopsy (at the time of a lateral pancreatico-duodenostomy) (21 for CP, 13 for pancreatic carcinoma). Overall, 68% of the patients met the histologic criteria for CP. The total number of EUS criteria present was predictive of histologic CP. The sensitivity and specificity were 87% and 64% using a threshold diagnosis for 3 or more criteria, 78% and 73% for 4 or more criteria, 60% and 83% for 5 or more criteria, and 43% and 91% for 6 or more criteria. From these results, it was concluded that a threshold of 4 or more criteria was the optimal threshold. Hollerbach et al. reported their experience with EUS-FNA in CP. These authors evaluated 27 patients with CP and compared the results of EUS with 22-gauge needle FNA with the results of ERCP. EUSFNA increased the negative predictive value to 100% and the specificity to 64%. EUS results were in agreement with regard to the severity of CP according to the Cambridge classification at ERCP in 5 of 8 patients with grade I, 11 of 13 patients with grade II, and 10 of 10 patients with grade III disease. Complications in the form of mild acute pancreatitis occurred in 2 patients (7%). On the average, 2.3 needle passes were needed to obtain a sufficient amount of tissue for diagnosis. This study better supports the role of EUS-FNA “in ruling out” rather than “ in ruling in” CP. However, it is already wellknown that a normal EUS examination virtually rules out CP in the appropriate clinical context. Larger needles, improvements in tissue processing, and molecular biology markers could, in the future, expand the application of EUS-FNA in patients with CP. These histologic studies suggest that EUS detects ductal and parenchymal changes in patients with suspected CP. A summary of the reported EUS criteria of CP and histologic correlates is shown in Table 1. Any comparison of EUS to ERCP must recognize that ERCP is not universally considered a gold standard. ERCP gives almost no information with regard to pancreatic parenchymal abnormalities. For example, this comes about when hyperechoic foci and strands along with a hyperechoic outer border and lobulation of the gland are encountered in the presence of a normal ductal system. In cases where the test results disagree (e.g., an abnormal EUS with a normal ERCP), it is not possible to resolve which test is correct, only to describe the differences. It is not accurate to state the sensitivity or specificity of EUS in this circumstance. Multiple studies have compared the results of EUS to ERCP in patients with abdominal pain and suspected CP [4, 5, 8, 15, 16, 17]. Three of these studies [4, 8, 16] used standardized EUS and ERCP (Cambridge classification) grading systems and can be compared directly. Each of these studies evaluated the pancreas for the presence of 9 to 11 described criteria and then considered EUS to be abnormal if the total number of criteria exceeded a threshold number (e.g., 3 or more, 4 or more, or 5 or more). It is clear from these studies that EUS and ERCP agree in approximately 80% of cases. In cases where they disagree, the vast majority (74%) is abnormal by EUS and normal by ERCP. Only 26% of discrepancies were ERCP abnormal but EUS normal. It is unknown if EUS is more sensitive to mild changes of CP than ERCP or if EUS is "overdiagnosing" early CP. The threshold for diagnosing CP based on EUS can be varied (e.g., 3 or more, 4 or more, or 5 or more criteria). The "sensitivity" and "specificity" of EUS compared with ERCP depends on which threshold is chosen. If a low threshold is used (more than 1-2 criteria) the "sensitivity" (and negative predictive value) will be very high, but the "specificity" (and positive predictive value) will be low. If a higher threshold is used (more than 5-6 criteria), the "sensitivity" (and negative predictive value) will be low, but the "specificity" (and positive predictive value) will be high. This relationship is best shown as a receiver operating characteristic (ROC) curve, which plots the sensitivity and specificity as the diagnostic threshold is changed. This also allows one to "choose" an appropriate threshold based on the question at hand. If the purpose of an EUS exam is to exclude the disease, a low threshold in the context of a low pre-test probability, will give the best negative predictive value. For example, a patient with only 0-1 criteria of CP by EUS has a >90% chance of having a normal ERCP  (and presumably does not have CP). In such a case, further testing is unlikely to identify CP and should therefore be avoided. If the purpose of an EUS is to establish the diagnosis with a high degree of certainty, a high threshold such as 6 or more EUS criteria gives a positive predictive value of >80% of having an abnormal ERCP. Those with an intermediate number of criteria may require further evidence to establish the diagnosis of CP. Two other factors must be taken into account when diagnosing CP based on EUS criteria. All criteria may not be equally important. For example, the presence of intraductal calcifications alone is highly suggestive of CP even in the absence of other criteria. In addition, there are age-related changes in the pancreas that may affect the diagnostic threshold. The pancreatic duct becomes progressively wider with hyperechogenic wall as the individual ages.. A 4-mm main pancreatic duct may be normal for a 70-yearold, but abnormal for a 30-year-old. Currently, there is no accepted scoring system that factors in these effects. One common practice is to require a higher threshold (e.g., 5 or more criteria for older individuals) and a lower threshold (e.g. 4 or more criteria for a younger individual). EUS criteria other than being solely quantified should also be correlated to the patient’s clinical history along with the presence of risk factors (ethanol, smoking). As with any diagnostic test, the pre-test probability (e.g., the probability that the patient has the disease based on clinical and other diagnostic tests) should be taken into account when interpreting the EUS results. The likelihood of disease after the EUS (posttest probability) is highly dependant on the pre-test probability, and the accuracy of the test. For example, a patient with vague abdominal pain and no risk factors for CP may have only a 30% chance of disease. In this setting, an EUS with 5 features only increases the post-test probability to 60%. Thus, other tests are necessary to confirm the disease. In that same patient however, a “negative EUS” (1-2 features) reduces the chance of disease to less than 5%. EUS is thus very useful for excluding disease in lowprobability patients. In contrast, patients with typical pain and risk factors have a higher pre-test probability, perhaps 60%. In this setting, a EUS findings of 5 features increases the probability to 85%, virtually confirming disease. These examples highlight the fact that EUS is most useful for excluding disease in low-probability patients, and confirming disease in high-probability patients. One significant limitation of EUS is found when dealing with a hyperechogenic pancreas which can obscure visualization of the criteria used to diagnose CP. This finding, commonly seen in patients with non insulin-dependent diabetes  or overweight individuals, suggests the presence of pancreatic fatty replacement similarly to fatty liver. In extreme cases, this can have the CT appearance of lipomatous infiltration of the pancreas also known as vanishing pancreas . Two studies have compared EUS to pancreatic function testing for CP [4, 8]. Overall, EUS and functional testing agreed in 75% of cases. As with the ERCP comparison, the main source of disagreement (71%) was in patients with an abnormal EUS but a normal functional test. Only 29% of the disagreement was due to patients with a normal EUS and an abnormal functional test. As with the comparison to ERCP, it is unknown if EUS is more sensitive to mild changes of CP than functional testing or if it is overdiagnosing early CP. The natural history may be the most definitive gold standard for early CP. A diagnosis of "mild" CP based on EUS, which then progresses to more severe CP as diagnosed by other tests (EUS positive, ERCP, positive functional test), is likely to be a correct diagnosis. Unfortunately, there are only limited data on the long-term natural history of "mild" CP diagnosed by EUS. Hastier et al. reported the short-term (mean: 22 months) progression of pancreatic disease in 17 asymptomatic alcoholics with an abnormal EUS but a normal ERCP. Follow-up EUS examinations for 12-38 months did not identify any progression to more overt (ERCP positive) disease. It is likely, however, that patients who took more than 55 years (mean age of study patients was 55.5 years) to develop "mild" disease, require more than 2-3 years to progress from mild to more severe disease. A cross-sectional study of alcoholic patients with and without abdominal pain by Bhutani  showed that the EUS diagnosis of CP (4 or more criteria) was positive in 89% of alcoholics with abdominal pain but also in 58% of alcoholics without pain, and 0% of control patients (non-alcoholic, no abdominal pain). More recently, Kahl et al. reported a subgroup of 38 patients with a history of chronic alcohol use and recurrent abdominal pain. At the time of enrollment in the study, 32 of 38 patients had an abnormal EUS but a normal ERCP. After a median follow-up of 18 months (range: 6-25 months), 22 of 32 patients developed changes of CP at ERCP (12 patients grade I and 10 patients grade II according to the Cambridge classification). Contrary to the study of Hastier et al. , Kahl et al. observed ERCP changes of CP in a short follow-up (18 months). The only significant differences between the 2 studies appeared to be the presence of alcoholic cirrhosis in Hastier’s study and the presence of abdominal pain and recurrent pancreatitis in Kahl’s study. Further long-term follow up data are needed. EUS has become an important tool in the diagnosis of CP. EUS detects changes of mild CP that may not be detectable with other imaging modalities or functional testing but which can be confirmed by histology. There is still controversy regarding the diagnosis of "early" CP based on EUS changes alone. Future studies will need to evaluate the ability of EUS to predict the presence of CP based on qualitative and not just quantitative criteria as well as correlating the pancreatic morphologic features to the patients’ risk factors and clinical follow-up. Studies comparing both EUS with fine needle aspiration cytology and EUS criteria for CP are under way. The search for a gold standard test to diagnose early chronic pancreatitis goes on. Wallace MB, Hawes RH, Durkalski V, Chak A, Mallery S, Catalano MF, et al. The reliability of EUS for the diagnosis of chronic pancreatitis: interobserver agreement among experienced endosonographers. Zimmermann MJ, Mishra G, Lewin DN, et al. Comparison of EUS findings with Histopathology in chronic pancreatitis [abstract]. Gastrointest Endosc 1997; 45:AB185. The International Working Group for Minimal Standard Terminology in Gastrointestinal Endosonography. Minimal standard terminology in gastrointestinal endosonography. Dig Endoscopy 1998; 10:159-84.